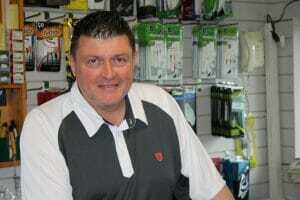 Dungannon Golf Shop will match any genuine quote from our competitors within a 40 mile radius of Dungannon. Competitors’ products must have stock available in store. Price Promise cannot be used with any other offers. Alistair Fleming has operated the Dungannon Golf Shop at Dungannon Golf Club for nearly 20 years. Alastair takes pride in providing excellent customer service, a friendly atmosphere and the best value golf equipment in Northern Ireland. We offer members and visitors a wide selection of golf equipment from the leading manufacturers Titleist, Ping, Taylormade, Footjoy, Addidas, Bridgestone, Pro-Quip and Cutter & Buck. Our SkyTrak Studio – the most accurate fitting tool in golf. To play your best you need golf clubs that are fitted to you. Our Custom Fitting Service helps you choose your preferred clubs in the correct specifications for you to maximise distance and accuracy. With our SkyTrak Studio we have the ideal facility for custom fitting. SkyTrak has outstanding accuracy indoors and with controlled conditions – zero wind, 20dec C and your own choice of ball, we have the most accurate fitting tool in golf. We presently have the Ping Custom Fitting Cart and will shortly have the Fitting Carts for other brands. Don’t stress yourself selling your clubs privately. Part exchange your clubs against a new set. It could not be easier. Simply bring your old equipment into the shop for an evaluation. We will confirm the value of your old clubs using third party and then the offer can be credited against the price of your new clubs. 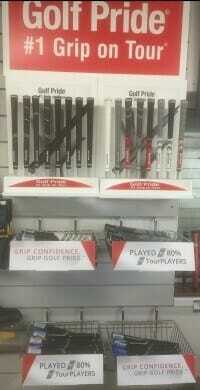 We also offer an extensive golf club repair service from re-gripping to re-shafting. New this season is our Golf Pride Gripping Bar.